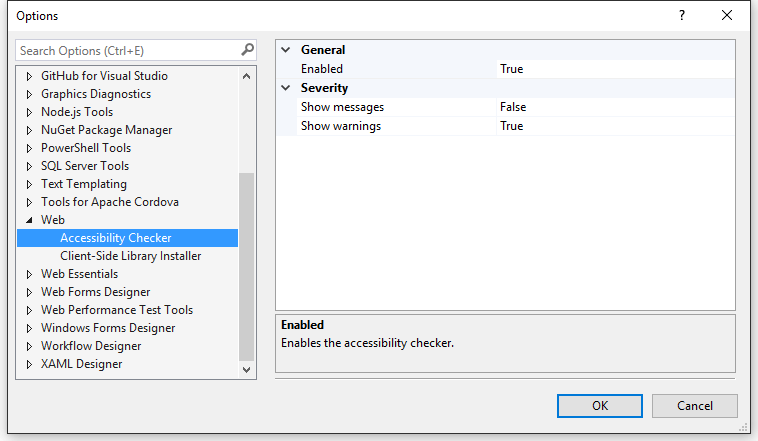 The easiest way to perform accessibility checks on any ASP.NET web application. Fully customizable and support all the major international accessibility standards. For this extension to work, make sure that Visual Studio's Browser Link is up and running. Do that by running an ASP.NET application from Visual Studio in one or more browsers. Hovering over the Browser Link button on the Standard toolbar lets you know if Browser Link is connected. The Browser Link dropdown menu hosts the Web Accessibility Checker sub menu. There are multiple command buttons in the menu. This will automatically run the accessibility checker every time a page loads in the browser - any browser. In addition to auto-running the checker on page load, doing it on demand can be helpful when you need to interact with the page to get it into a state you want to check. This is also a great way of running on demand only if you disable Auto-Run on Page Load. Clicking this command will add a configuration file to the solution. It's a JSON file containing all the rules being run. 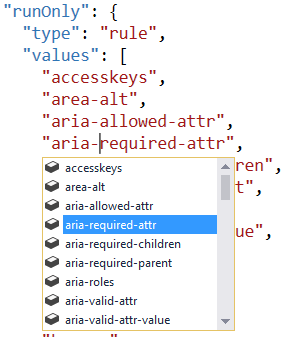 You can customize it by adding and removing rules and there is full Intellisense for all the rules. Some global settings can be configured in the option dialog. This extensions uses the axe-core library to perform the accessibility analysis. All rules are completely customizable and can follow the project or solution. Errors found on the page will automatically populate the Error List in Visual Studio. In some cases it is known exactly where in the source code the issue is and double-clicking the error take you straight to the location. To clear all accessbility errors from the Error List, simply right-click and hit Clear All Accessibility Errors.